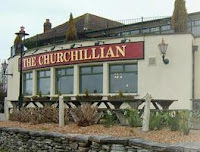 The Churchillian is situated on top of Portsdown Hill, which gives for lovely views, especially if you book the window table as Mike did here for our visit. The menu was ok, if a little on the heavy side, especially in the dessert menu. The food was of good quality and the staff were friendly. It does get busy here, so i would recommend booking, a must if you want the window table. Not a bad outing, we enjoyed ourselves!